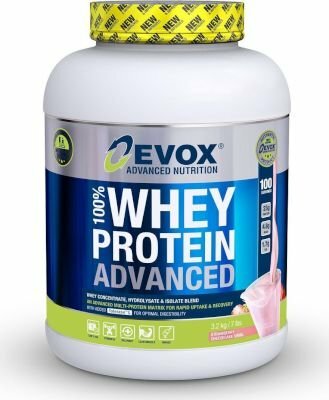 EVOX 100% WHEY PROTEIN ADVANCED is the ultimate protein supplement for any time of day, as well as in the post-workout recovery phase, providing the nutritional support, nitrogen retention and amino acid conversion needed to support accelerated muscle tissue repair and recovery. This advanced formula now includes minimal fat and carbohydrate values, with Tolerase- L for a supported and sustained protein uptake. UseInstructions: Take 3 heaped scoops (3 scoops = 36g) with 200 - 300ml cold water or skim milk. Add or remove water or skim milk to acquire desirable taste and thickness. 100% Whey Protein can be used to supplement your mid-morning, mid-afternoon and post-training meals. Best used for active individuals on muscle maintenance or growth program.